A. Efficient Windows: help to control and reduce ultraviolet light that can fade carpets and furniture, helping to keep your belongings looking like new and keeping window areas cooler and more comfortable to sit near. Window flashing protects against water leaks. C. Right-Sized and High-Efficiency HVAC Equipment: costs less to install than bigger equipment, saves energy, and is designed to comfortably handle heating and cooling loads. 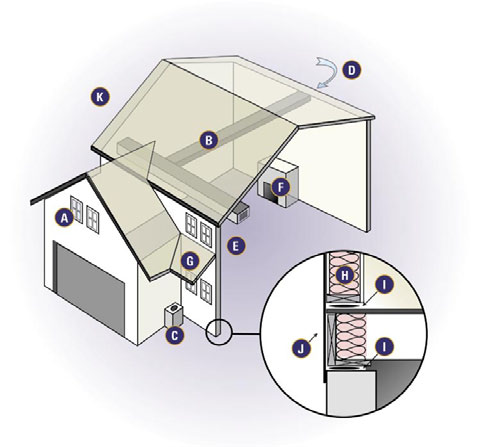 D. Ventilation: exhaust fans remove moisture and pollutants. A controlled, filtered air intake ensures plenty of fresh air. A fresh air intake is an ENERGY STAR requirement. E. Dehumidifier: sometimes needed to control indoor humidity, may be needed for basements. F. Sealed Combustion Appliances: reduce moisture buildup and ensure the removal of combustion gases. We recommend against non-vented combustion appliances such as non-vented fireplaces or heaters. G. Overhangs: provide shade and direct water away from the house. Overhangs are not required by ENERGY STAR but are a sign of thoughtful design. H. Insulation: holds comfortable temperatures in conditioned spaces and helps control noise. For insulation level recommendations see your local building codes. I. Air Sealing: stops drafts, helps keep humidity and garage contaminants out of the house, and creates a barrier to rodents and insects. J. Well-Designed Moisture Barriers and Drainage: avoid expensive structural damage and help stop humidity, mold, and mildew. K. Building System: Perhaps the best thing about buying a system-designed house is that all of the parts are designed to work together. This can save you money on the purchase price, and it also means a durable and comfortable system, one that will help avoid maintenance and repair costs down the road.